SPF is used to prevent spammers from using an email address on your domain as their sender address, known as email spoofing. With SPF you can define the outgoing mail servers that are authorized to send email from your domain name. 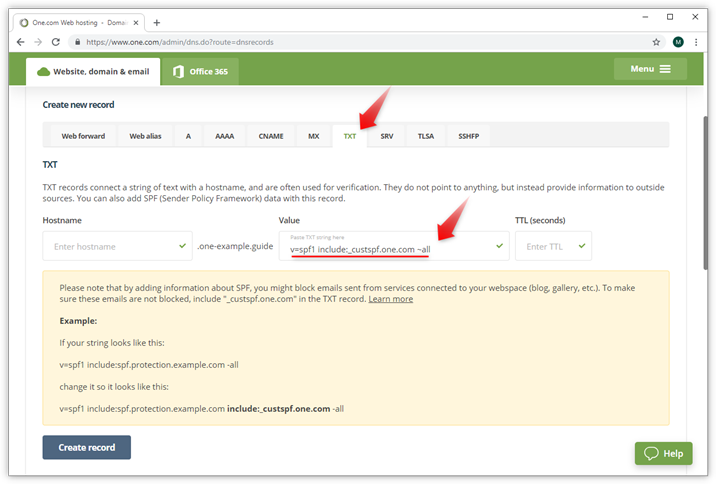 When an email is sent from your domain, the incoming server checks if the mail comes from an approved server, before delivering it to the recipient. If the information doesn't match, the email is identified as unauthorized and will be rejected or delivered to the spam folder. Unfortunately, not all incoming mail servers check for SPF records. So even though adding an SPF record will help, it cannot prevent all spoofing. Follow the instructions below to add an SPF record on your domain. Keep in mind that it takes up to 90 minutes before your change is active. Log in to your One.com control panel and click DNS settings on the Advanced settings tile.